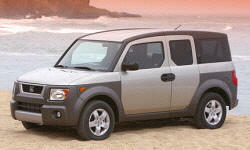 Honda Element Driving Position & Visibility Pros and Cons | Page 1 of 1 | Why Not This Car? What drives people to buy (or not buy) a certain car? TrueDelta's members share Honda Element pros and cons based on their real-world driving experiences. This vehicle as purchased for my 18 year old son, lots of windows, no blind spots, seats can be adjusted adequately to see all around vehicle.